Treatment for bruxism will vary, depending on the severity and cause. Sometimes simple behavior modification or relaxation techniques may be enough to reduce teeth clenching. 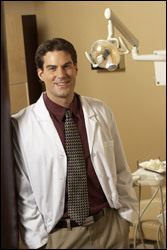 If bruxism is caused by dental problems, Mendelson Family Dentistry, PA can work with you to correct the malocclusion. Other possible solutions include dental appliances which can also protect the teeth from the impact of grinding. Unfortunately, you may not even realize that you have bruxism until it causes significant damage to your teeth. If you suspect you may be grinding your teeth, visit Mendelson Family Dentistry, PA for an evaluation. During regular visits to our Owings Mills office, the teeth are examined for evidence of grinding, such as jaw tenderness and abnormalities in your teeth. Mendelson Family Dentistry, PA can help you identify your cause of grinding and determine the best treatment to help you stop.